Welcome to The Kester House & Garden Project! This site has been created to document our rather in-depth home renovation project. Friends and family ask about the status from time to time, so this will serve as a place to keep track of our progress. I also use the site as a place to store photos, plans, and technical information (like paint colors, etc.) so I can find that information when I need it. 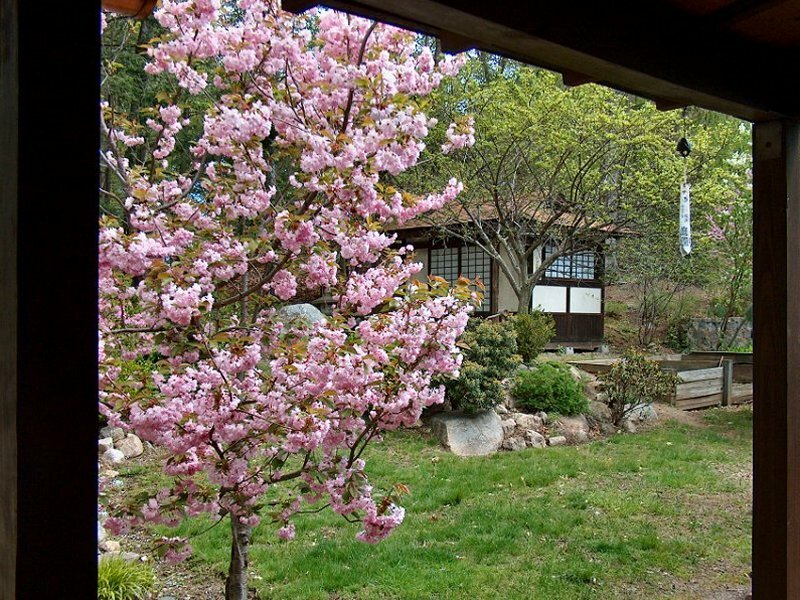 The garden is starting to blossom after a chilly Spring (1 photo). If you're visiting the site for the first time, after having a look at this Welcome page I recommend reading the House and Inspiration sections before you dive right in, so you'll have an idea of what we started with and what we're hoping to end up with. I've been writing about the project in the order we've been working on it, so the Garden sections would be next, followed by the Exterior sections and finally the Interior sections. I often add new information or photos to various sections, so the News section below will always have links to the latest updates. There's also a Table of Contents at the bottom of this page with a brief description of every page on the site. Additionally, if you're looking for information about a particular project, you may find the table available on the Project Timeline useful, since you may click on the project name to go directly to the information regarding that specific work. The House: The weather turned very warm this week, so I spent some time doing yard work between getting coats of finish on that double-screw vise. I'm happy to say the bench-on-bench double-screw vise appliance for the joiner's bench is now completed, and turned out very well. The only things left to call the joiner's bench project done are to make a few minor appliances (a couple bench hooks, a shooting board, and a sticking board), and then a tool storage cabinet to fit under the bench. The Vanagon is also back on the road after a pair of new tie-rods and an alignment, so I'll be able to get the lumber too start work on the ceilings in the living room and bedroom soon. Other projects include giving the pond a major clean out, then I can get back to that Bamboo behind the pond, and see if I can get the rest of the containment barrier installed and the fence up before we get too far into Summer. The Site: I've added a new section detailing the build of the bench-on-bench double-screw vise to the Joiner's Bench page, including over twenty photos of the construction process. As usual, that new chunk of information warranted a site search index refresh, and an update to the Project Timeline. The House: I've made some good progress on the double-screw vise appliance for the joiner's bench, although things are slowing a little on that project as I get some finish applied to the interior bits prior to assembling the thing. I should have an update with lots of photos of the construction process soon. As I mentioned last update, I received the replacement right radius rod for the Vanagon, as well as the bushing and hardware kits for the rod end bushings on both sides. Getting that 28-year old suspension hardware apart was no picnic (I snapped the end of my 18-inch breaker bar trying to get the rod end nut off the left side), but with a little patience and lots of leverage, I got everything taken apart with no further breakage. Before putting in all the new parts, I gave everything a good coat of VHT ®SP229 Rust Converter , then hit it all with some black enamel. I set the length of the radius rods pretty close to where is was before taking everything apart so the vehicle should drive okay, but my first trip will be to the shop to get a proper front end alignment. I also picked up a pair of tie rods and steering rack boots, so I'll have the guys at the shop replace those when they do the alignment too. Hopefully that'll take care of the Vanagon for the Summer, so I can get back to house and yard work. The Site: No major content update this time, although I've been taking lots of photos of the bench-on-bench double-screw vise, and once I've gotten the finish applied I'll update the Joiner's Bench page with that information. I did recently purchase a couple more Stanley planes (a No. 48 and a No. 171), so I've updated the Vintage Hand Tool Data and Vintage Tool Gallery pages with the appropriate information. The House: After far too much time tinkerin', I've finally completed the mechanism I dreamt up to lift the bench dogs out of the row of blind holes along the front of the joiner's bench. I'm still doing a little work re-fitting the dogs to accomodate the lifters, and re-applying finish to the few I needed to shorten, but that part of the bench project is basically taken care of after months of occasional work. 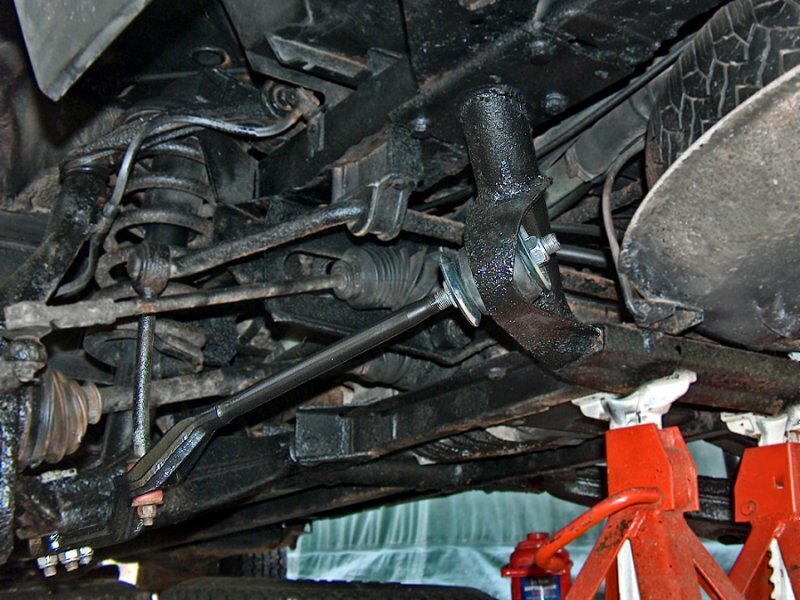 Other stuff that's going on is that I had some fun with the Vanagon recently... fun being that while running errands with the thing I hit a pot hole and snapped the right front radius rod (which pretty much holds the rest of the suspension components in place). With the radius rod broken, it's not like the wheel or control arms can fall off the vehicle, although driving the thing home after the break was a little freaky. The replacement part for the Synchro Vanagon has long been unavailable, but I was fortunate enough to find a used one from GoWesty. As long as I need to go under there for front end work, I'm going to replace the rod bushings for both sides while I'm at it. I'm just waiting for things to dry out a bit outside (we've gotten a lot of rain recently) before I tear in to it. The Site: I've added a new section with all the details and plenty of assembly pictures of the bench dog lifters to the Joiner's Bench page. I was also recently checking the site for a power tool owner's manual, and realized I've purchased a few new power tools over the last few months and neglected to update the information on the Power Tools Specifications page, so that has been taken care of with specs and PDFs for a new Porter Cable Router, Dovetail Jig, and a couple more Milwaukee M12™ cordless goodies. The Project Timeline and site search index have been refreshed as well. The House: Like last year, I've been less than diligent with my web site updates. The good news is there has been some activity toward getting to work on the house again, although it hasn't been anything exciting... Years ago, I had a problem with trying to find boxes to pack stuff for moving. As a renter, I always assumed I would need to pack up the contents of the house again someday and move, so whenever I purchased anything of significance (household appliances, computers stuff, home entertainment items, etc.) I would take the box full of packing materials and toss it in the attic. Then when it came time to move, I could re-pack anything I had back in the original box for moving. We then managed to buy the house we were renting and negated the need to pack stuff up again. No big deal - it's not like an attic full of boxes was bothering me while working on the house and yard, until recently. The next few projects for the house renovation involve work on the living room, bedroom, and walk-in closet areas. To get started on those areas, I need to remove the existing Homesote ceiling, shim out all the rafters to level things, then install lighting wiring, attic insulation, and a new ceiling. That means lots of work in the attic, and the attic is packed with boxes full of styrofoam packing materials. Aargh - all that stuff needed to go away. So that's what I've been fiddlin' with since last Fall - cleaning out the attic. Not as easy it sounds. The way our municipal trash collecting works is each house gets a town provided rubbish barrel for weekly pick-up. We may also put out as many recyclables as we want each week. Put it all on the curb and it goes away. There is no town dump, so if you have more stuff than what fits in the rubbish barrel, you need to purchase specially marked, blue "town trash bags" from a local hardware store to add to the curbside heap. Since styrofoam is not considered a recyclable item, it all needs to go in the trash. Basically I've been cutting up boxes to fit in the recycle bins, then breaking up all the styrofoam stuff to fill an extra blue bag or two each week since last November. I got the last of the empty boxes out of the attic last week. Like I said, there were a lot of boxes up there. There's still a fair amount of stuff in the attic, so now we're working on getting everything into 12 gallon, lidded plastic storage bins. We have off-season cloths and boots, bedding, and lots of the usual "attic stuff", although I'm trying to make as much of that go away as I can. The bins stack nicely, slide around the floor to move out of the way, and are clear enough that we can see the contents without having to open each one. With a bunch of stacked bins in the attic, I should be able to start working up there soon. Of course the other project I'm still tinkering with is the joiner's bench. The last thing I did on that was get some tool racks with power strips and lighting installed. 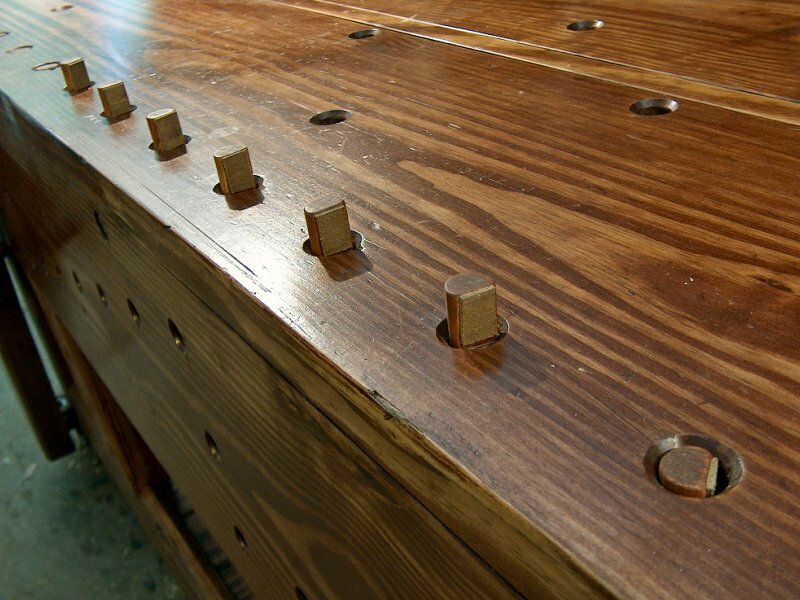 I also filled all the blind dog holes holes along the front edge with a bunch of home made bench dogs to prevent the holes from filling with sawdust and shavings. That led to another issue to resolve: how to remove the front row dogs when they're buried in a blind hole behind that big front apron. This was something I'd given some consideration to back when I designed the bench, so recently I've been working on that dog removal problem so I can move forward with building the lower tool storage box. I should have some information to post regarding how I did that soon. The Site: Nothing much to add to the site, even though it's been a few months since the last update. I haven't been snapping pictures while I break up styrofoam and cutting up cardboard boxes, and no one wants to see that anyway. I did go through each page of the site and verify all external links. It seems many of those were not working, so they've been editted to work properly, or removed in a few cases. I've also done the yearly clean-up to this news page by moving the handful of 2016 news items off to their own 2016 News Archive page, then updated the Project Timeline and site search index, as usual. Visitors should check this page to determine the most recent updates, or browse the sections listed in the navigation menu on the left. I'll try to always have a picture of the most recent project or the house itself on this page too. The navigation menu will expand when you hover your curser over an item with a down arrow (↓) in the name. The section you are currently visiting will display in a different color than the rest of the menu so you hopefully won't get lost. There's an up arrow (↑) near the bottom of each page that will return you to the top of the page when clicked. Links in the body text will display in a different color than the rest of the text. All internal links (links in the body text or nav menu sections) will replace the contents of your browser's current window with the target's content when clicked, so you may navigate using the 'forward' or 'back' controls of your browser. External links (links to other sites) are in the footer and will open in a new browser window (or tab) when clicked. If an external link is placed in the body of the page, it will be indicated with an icon: . When you click the 'SEARCH' item in the nav menu you'll be presented with a search box to enter the keyword(s) you'd like to find. Hit your 'enter' key or click the little magnifying glass and your browser will load the search results page with your search terms highlighted. When you navigate to a page from the link provided in the search results, the search terms will also highlight in the new page to make them easier to find. When you click on a photo it will enlarge in the browser window and the background around the image will darken to allow better viewing of the image. If there are additional photos on the particular subject, you will find controls to view those additional photos below the bottom-right corner of the image. You may also hover your curser over the image to use the Next and Previous buttons when there's more than one photo in the group you're viewing, or view the set as a slide show by using the Play and Pause buttons below the image. To open an individual photo in a new window (in case you wish to bookmark the image, or copy it for appropriate use), click the small Expand icon in the top-right corner of the photo. To return to the normal page view, click the small X below the image, or click anywhere on the background around the photo. The footer contains a link to send us an e-mail if you'd like to make a comment or suggestion. It also contains external links (they all open in a new window) to other sites I enjoy, as well as a few of those trendy little icons to bookmark the current page on various social networking sites. I've checked a screen shot from all the browsers above and everything appears fine using the latest versions. Functionality is as expected in all versions running on Windows XP SP2 (since I don't have a MAC or OpenSource machine to test on), so I think we're good to go. If you find the site has stuff hanging off the page and there's text on top of other text, you may want to upgrade your browser to the latest version for your platform. Here's a description of what's included in the sections - some are more complete than others but it's all getting there. 2008 News Archive contains the updates from the News section for 2008. 2009 News Archive contains the updates from the News section for 2009. 2010 News Archive contains the updates from the News section for 2010. 2011 News Archive contains the updates from the News section for 2011. 2012 News Archive contains the updates from the News section for 2012. 2013 News Archive contains the updates from the News section for 2013. 2014 News Archive contains the updates from the News section for 2014. 2015 News Archive contains the updates from the News section for 2015. 2016 News Archive contains the updates from the News section for 2016. The House is about the original structure, the purchase, and the first big project - installation of the new septic system. The Garden is about the garden renovation, with information on the lot, initial landscaping, front yard, the irrigation system, and Pine pruning. Design addresses the decisions about the garden design and construction, including a complete plant list and details of the construction of our stone lanterns. Pond showcases our goldfish pond. Bonsai is about our attempts to get some bonsai started. Garden Shed is about the construction of the prettiest potting shed ever. 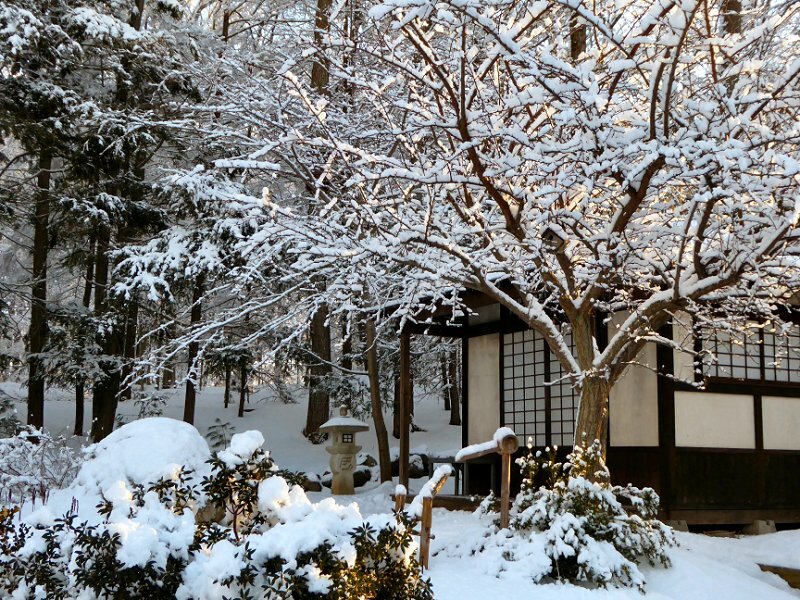 Teahouse is about the construction of our Japanese-style tea house. Exterior introduces the exterior projects of the renovation. Foundation is about repairs made to the foundation. Roof is about the new roof design and replacement. Windows & Doors shows the installation of these units. Siding & Trim covers the siding and trim work, including gable ends and soffits. Engawa & Tsukimi-dai pertains to the planning and construction of the decks. Garage design and building is still on the drawing board. Genkan is about the new foyer. Kitchen is about the kitchen remodel. Bathroom is about the bathroom makeover. Living Room is about the living room remodel. Bedroom contains the bedroom and walk-in closet. Wiring covers the re-wiring (lighting for each area is covered in the sections above). Plumbing explains the water supply systems (fixtures are covered in the Interior sections). HVAC is about the heating, ventilation and air conditioning systems used in the renovation. Energy Efficiency covers steps we're taking regarding weatherization, insulation and reduced energy costs. Inspiration attempts to address why we decided to build a Japanese style house, and why we're doing it ourselves. Specifications contains reference information regarding the house and equipment, plans, supplier information, etc. Color Palette has all color chips and color codes for finishes. Timeline is a chronological list of renovation projects and tasks, with links to the appropriate sections of the site. Hand Tools contains a list of vintage hand tool data, as well as catalogs and reference books regarding my ever-growing collection. Power Tools is a list of power tool data with PDF documentation for most tools. Et cetera contains my ramblings on this or that, not specific to the house renovation. Currently the page contains some information regarding our sailing dinghies and vintage outboard motor, as well as a new section about our old Volkswagens and my time at GreenWheels Electric Car Company. Hand Planes details the restoration and tuning of vintage metal hand planes. Joiner's Bench addresses the design and building of an English style joiners bench. Shop Equipment has information about bench vises and other shop equipment that'll end up in the garage eventually. Vintage Tools contains images of all my hand planes and other vintage hand tools. © 2009 Jeffery A. Kester and Kimie M. Kester. Some Rights Reserved. Unless otherwise noted, this work is licensed under a the Creative Commons Attribution-Noncommercial-No Derivative Works 3.0 United States License. For purposes of attribution, the work available at , was created by Jeffery A. Kester. Digital photography by Kimie M. Kester.